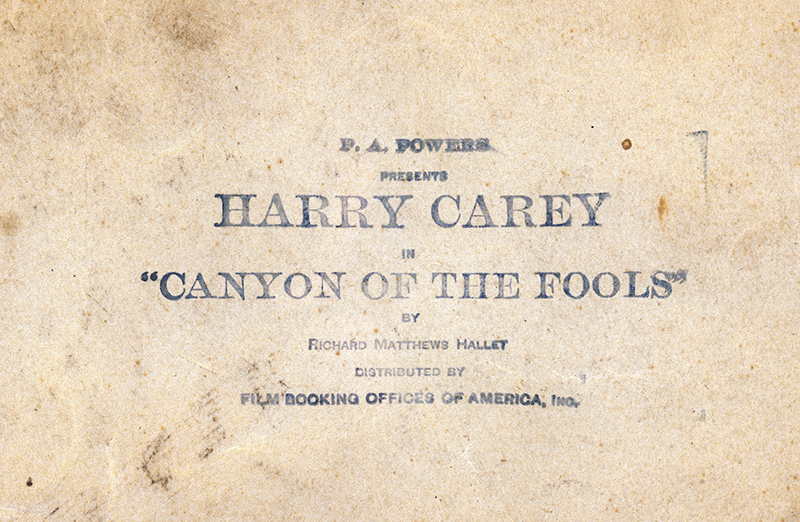 SCVHistory.com LW3418 | Film-Arts | Saugus Resident Harry Carey in 'Canyon of the Fools' (1923). 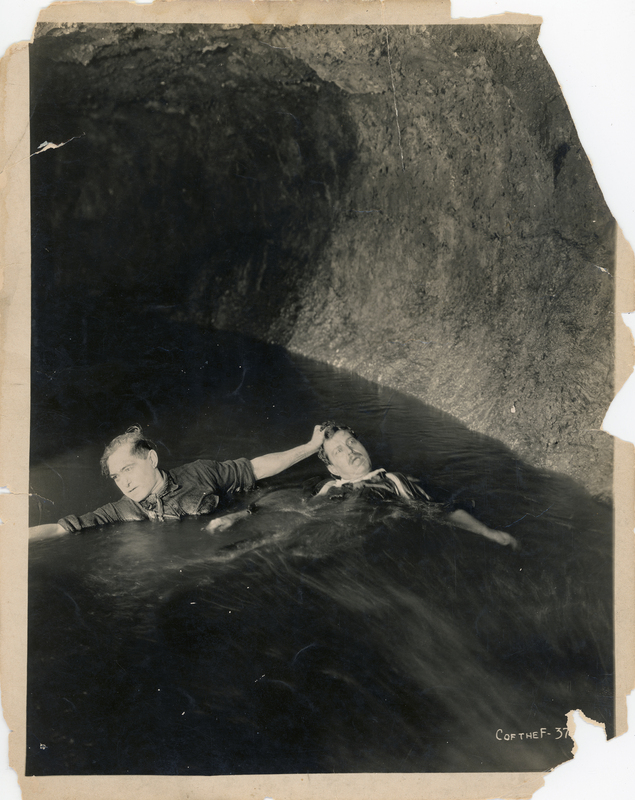 Fragile, impaired 8x10 publicity photo showing movie star and Saugus rancher Harry Carey in a water sequence in 1923's "Canyon of the Fools" from Robertson-Cole Pictures Corp., distributed by Film Booking Offices of America (FBO). The picture premiered January 21, 1923, and was re-released in New York City on January 22, 1930. After that, it was never seen again ... until 2010, when a print showed up in Gosfilmofond, the Russian state film archive in Moscow. A digital copy was presented to the (U.S.) Library of Congress on October 21 of that year, along with nine other previously "lost" films (see below). According to Patrick Loughney (pers. conv. September 2018), director of the Packard Humanities Institute facility in Valencia (the PHI Stoa), 75-76 percent of all movies made between 1913 and 1930 remain lost despite the occasional discovery of a film print in Eastern Europe — usually in Prague, Moscow or St. Petersburg, Russia. (Loughney headed the Moving Image Section of the Library of Congress since 1995 and ran the LOC's National Audio-Visual Conservation Center when it opened in Virginia in 2008.) "Loss" occurred because movie theaters played the prints until they wore out, or because they didn't return them to the studios when they were supposed to, and even when they did, the unstable nitrate film stock dissolved over time into a gooey, sulfury mess and/or caught fire. Twentieth Century-Fox lost its entire film vault to fire in 1937 (including many Tom Mix-in-Newhall pictures), followed by Warner Bros.' film vault in 1965. In most cases, when smaller, independent silent-era film companies went out of business, their old, used widgets went into the garbage. Officials in Eastern Europe, where the arts were more state-controlled, tended to put old films into (very) cold storage. Below 30°F, nitrate film doesn't quickly deteriorate. Of local interest, John Ford's 1917 "Straight Shooting" (filmed in the Santa Clarita Valley with Harry Carey) and Edwin Carewe's 1928 "Ramona" exist today only because of prints that turned up in the Czech National Film Archive in Prague. 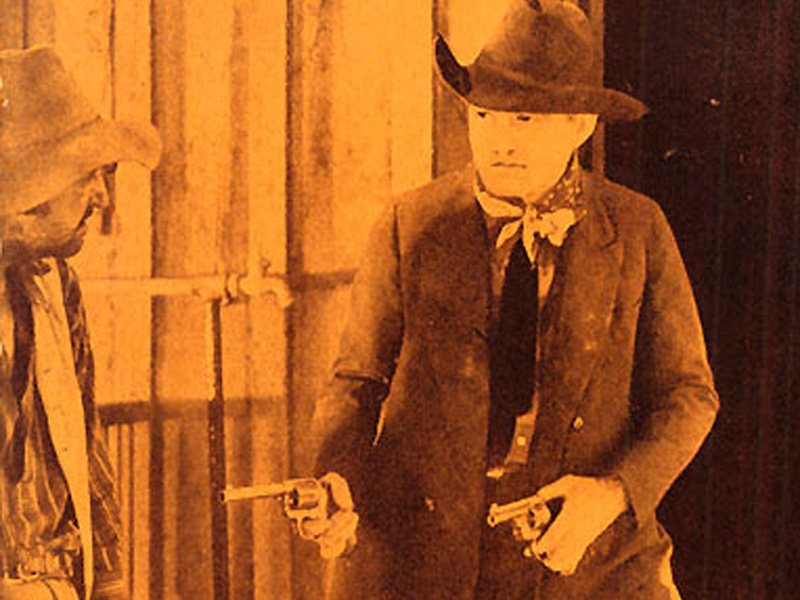 According to the April 1923 edition of the Motion Picture News Booking Guide, "Canyon of the Fools" is a "Western melodrama carrying intrigue based upon capture of bandits and flavored with romance. Adapted from Richard Matthew Hallet's novel. Hero has been framed and goes West to search for the man responsible for his disgrace. Meets his old sweetheart, who is the fiancée of the villain, the latter appearing under an assumed name. The hero gets involved in a quarrel between Mexican lovers and is locked up, but Sheriff allows him his freedom if he will capture the bandits. The hero succeeds after many difficulties and exposes the real crook. He wins the girl." Motion Picture News has the film at 5 reels; other soures say 6. So, the runtime is either a little less or a little more than an hour. "Canyon of the Fools" is directed by Val Paul from a screenplay by John Grey. Also featured are Marguerite Clayton, Fred R. Stanton, Joe Harris, Jack Curtis, Carmen Arselle, Charles Le Moyne, Vester Pegg, Murdock MacQuarrie and Mignonne Golden. 'Lost' Silent Movies Found in Russia, Returned to U.S.
By Kelly Marshall Smoot / CNN / October 21, 2010. There weren't any starlets or red carpet, but the Library of Congress had a blockbuster day at the movies on Thursday (October 21, 2010). The government of Russia presented the Library of Congress with digitally preserved copies of 10 silent films that previously had been thought to be lost forever. According to the Library of Congress, more than 80 percent of American movies from 1893-1930 — also known as the "silent era" — no longer exist in the United States. Like today's movies that are distributed to theaters around the world, many of those early silent films were circulated internationally. Over the past 20 years, the Library of Congress has discovered some of the missing films in international libraries and archives, like the Gosfilmofond, the Russian state film archive. "A study published by the Library of Congress in 1993 concluded that the majority of U.S. movies from the 1920s survive only in foreign film archives," said Librarian of Congress James Billington. He went on to explain that in the days of early American movie-making, many studios and theaters simply threw old movies away. Russia, he explained didn't generally throw them away. Many of the films sat in storage, making it possible for them to be preserved for restoration today. Caroline Frick, curator of motion pictures at the George Eastman House museum of photography and film in Rochester, New York, said such film repatriation projects are exciting, with "a huge array of film history that still remains unknown because so many of the films don't exist." Frick explained that Russia's digital preservation of American silent films is an example of how film preservation itself has changed, especially in the last 10 years. "It used to be that you preserved on film but now we have a multitude of ways, including making digital copies so that the images are preserved." Included in the restored movies is a 1923 film staring then-child-star Jackie Coogan, called "Circus Days," about a boy who runs away from his uncle to join the circus; and "Canyon of the Fools," starring Western movie star Harry Carey. Billington accepted the digitally preserved movies on hard drives presented by Vladimir Kozhin, head of Russia's Presidential Management and Administration Department, at a ceremony Thursday. These ten films are the first of hundreds that will be repatriated over time. LW3418: 9600 dpi jpeg from original photograph purchased 2018 by Leon Worden.